Meet global warming's sister. Although global warming often makes headline news, acidic oceans can also have devastating effects on Earth's environment. They once triggered the "Great Dying," which was Earth's worst-ever mass extinction. Scientists said that CO2 released from massive volcanoes in Siberia turned the ocean acidic and wiped out most of Earth’s sea life during the world’s worst mass extinction event 252 million years ago. The new revelation shows dire similarities to modern climate change. The study has been published in the journal Science that reveals the first hard evidence that ocean acidification was behind the mass extinction of aquatic life on Earth. This dramatic acidification of the oceans near the end of the Permian period came as a result of a regular series of super-volcano eruptions that created carbon dioxide at a rate that at the moment is being exposed to the oceans today. The researchers said the decline in the PH of the oceans was the driving force behind the deadliest phase of the extinction, which dealt a final blow to an already unstable ecosystem. 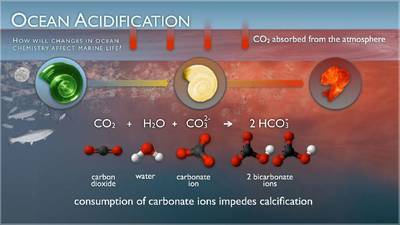 Dr Matthew Clarkson, of Edinburgh University's School of GeoSciences, who co-ordinated the study, said: "Scientists have long suspected that an ocean acidification event occurred during the greatest mass extinction of all time, but direct evidence has been lacking until now. This is a worrying finding, considering that we can already see an increase in ocean acidity today that is the result of human carbon emissions." The study was conducted by analyzing rocks unearthed in the United Arab Emirates which were on the ocean floor at the time of the cataclysmic eruptions. The rocks preserve a detailed record of changing oceanic conditions at the time. "So it sort of acts as a warning that if we keep going at the rate we are, and burn everything available to us, this is the sort of thing we might expect to happen," adds Clarkson.